Anders Behring Breivik (born Oslo, Norway, February 13, 1979) was accused of, and has since confessed to, murdering 77 people during a killing spree in Norway on July 22, 2011. On that day, a bomb was detonated near government buildings in the capital city of Oslo, killing eight. Some 90 minutes later, Breivik went to a summer camp on the island of Utoya and began shooting, killing 69 people, adding him to the growing list of atheist shooters and serial killers. Breivik describes himself as an investor, director, manager, revolutionary conservative, and resistance fighter. Prosecutors have said that Breivik played the video game World of Warcraft for nearly seven hours daily. On August 24, 2012, a Norwegian court found Breivik sane and guilty, and sentenced him to prison for a period between 10 and 21 years, the maximum prison sentence for his crime, but under Norway's preventative detention law, it can be extended if Breivik is considered a danger to society. His only apology was that he did not kill more people. Utoya, an island located approximately 20 miles northwest of Oslo, has been used by the Worker's Youth League (AUF), the Norwegian Labor Party's youth wing, since the 1970s for summer camps. Between 600 and 700 people were on the island on July 22, 2011. Around 16:57 local time, a man dressed as a policeman requested passage on a local ferry over to Utoya. He stated he was there to "do research in connection with the bomb blasts". He was reportedly armed with a pistol and an automatic rifle. According to witnesses, he gathered the camp atendees around him for an announcement, then began shooting at them. The people panicked, and began running in an attempt to get away. Some tried to swim to the mainland, and were shot while still in the water. The first reports of the shootings reached authorities at 17:26, and by 17:40, a specialized SWAT team was dispatched from Oslo to the island, arriving at 18:09. Local police were already at the ferry crossing, but were waiting for a boat. Difficulties arose when the police boat was loaded with the men and equipment; the boat was too small and began to take on water. Recreational boats were used instead, and the authorities arrived on the island at 18:26. By this time, the shootings had been going on for over an hour. When the police reached the gunman, they found him standing with his hands up, and his guns several yards away on the ground. He didn't resist arrest, and according to police, still had a significant amount of ammunition remaining. Sixty-nine people, mostly teenagers, were killed in the shooting spree, with scores of others injured. Hospital officials reported Breivik used dum-dum bullets, which are designed to cause severe internal damage because they disintegrate within the body. Norwegian newspaper VG Nett claims Anders Behring Breivik had been put on a terrorist watchlist after illegally buying large amount of chemicals online from a Polish retailer. The Norwegian Foreign Minister had visited the Labour Youth League summer camp on the island of Utoya Thursday, and was met with claims that Norway must recognize a Palestinian state, which Breivik also opposes as part of his nationalistic beliefs. Breivik also supports nationalistic movements in India. While Breivik was custody, the prosecution said Breivik had behaved calmly and did not seem to be affected by events. The lawyer representing Anders Behring Breivik had stated that his client is most likely insane. Since Breivik admitted to the attacks, his sanity was the key issue to be decided by the trial, with two psychiatric teams reaching opposite conclusions. On August 24, 2012, a five-judge panel declared him sane and guilty, and sentenced him to a 21-year prison sentence, but which can be extended for as long as he's considered dangerous to society. Legal experts said that likely means he will be locked up for life. In his final words, Breivik insolently regretted not killing more people, apologizing to other "militant nationalists" for not achieving an even higher death toll. Neither the prosecution or the defense indicated they would appeal. Conservative media has called attention to Breivik's relative plush prison conditions. Although being in solitary confinement, his prison compound consists of three personal cells, with one being for living, one for studying, and a third unit for physical exercise. Breivik is able to do his own laundry and cook, while the study cell contains personal computer, not connected to the Internet, and a television and a PlayStation 2. Breivik threatened to go on a hunger strike if it was not upgraded to a PlayStation 3. In April, 2016, an Oslo court ruled that his solitary confinement and undressed searches constituted a breach of human rights. Over a period of approximately three years, Breivik wrote and/or compiled a 1,518 page, partly plagiaristic manifesto titled 2083 – A European Declaration of Independence, half of which he states he wrote himself. He sent this to 8,000 dedicated nationalists just before his murderous rampages began, and which was subsequently converted to a PDF file and posted on the Internet after the attacks. 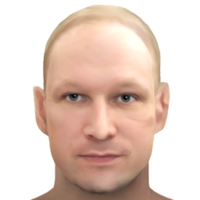 Breivik's manifesto states that he is "100 percent Christian", but not "excessively religious"; he considers himself a "cultural Christian" and a "modern-day crusader". Breivik says the term cultural Christian means preserving European culture, and adds, "It is enough that you are a Christian-agnostic or a Christian-atheist (an atheist who wants to preserve at least the basics of the European Christian cultural legacy...)" He stated that he planned to pray to God for help during his attacks. The manifesto also states "I'm not going to pretend I'm a very religious person, as that would be a lie"; Breivik calls religion a crutch and a source for drawing mental strength, and says "I've always been very pragmatic and influenced by my secular surroundings and environment." He goes on to state that "myself and many more like me do not necessarily have a personal relationship with Jesus Christ and God." In his manifesto Breivik details how Islam invaded Europe in the past and was defeated, and expresses plans to combat, by an "armed indigenous rights movements/resistance movement" (p. 668), the latest Islamic invasion/attack in which they employ "demographic warfare." (p. 816) Breivik resistance involves raising up an army of Justiciar Knights, PCCTS, ("Pauperes commilitones Christi Templique Solomonici" or "Poor Fellow-Soldiers of Christ and of the Temple of Solomon" in English), commonly known as the Knights Templar,(p. 1509) which Breivik claimed had been re-formed in London in 2002. Breivik's compendium/book presents "advanced ideological, practical, tactical, organizational and rhetorical solutions and strategies" for his war against "Islam and the cultural Marxism/multiculturalism in Western Europe," and its different political fronts, and the reestablishment of a secular "Christian" Catholic culture, and thus the restoration of Europe's cultural self-confidence (nationalism) by 2083. (pp. 4, 5, 802) Its extensive instructions include prolonged violence and the advocation of the use of drugs to enhance performance. The manifesto also shows that Breivik was an active player of the World of Warcraft (and other computer games), and indicates that he was inspired by such themes. While the manifesto contains a legal disclaimer that states certain chapters in Book 2 and Book 3 (a Declaration of pre-emptive War) were hypothetical, and "must not be confused with an actual plan, or strategy to attempt to harm any individuals...," and that the author does not condone such, (p. 766-68) yet it has become apparent that this disclaimer itself was part of his malevolent strategy. Many liberal media articles characterized the gesture Breivik made in court as a "right-wing salute." Fox News described it as a "clenched-fist salute." On his Facebook profile, Breivik describes himself as a Christian. He states that he chose to be baptised into the Protestant Church of Norway at the age of 15, although he later became disenchanted with Norway's State Church. He supported “an indirect collective conversion of the Protestant church back to the Catholic” in an online post in 2009. Likewise, some reports were quick to described Breivik as a “Christian terrorist,” based largely on his self-identity as one on his Facebook profile, and his postings to some Christian fundamentalist type websites on certain shared views. The multiculturalists WANT us to fit in their pre-defined stereotype. They want us to be racists, fascist, gay hating individuals because it would make their job so much easier in their effort to label us as the scum of the earth. The truth of the matter is that I personally know several gay individuals and have known several gay people during the years and I don't have any reservations against them. Why would I care what they do behind closed doors? The attacks left the world stunned, not only due the number killed in such a manner, but because it happened in Norway, a country seen as relatively peaceful. And which was also due to the murdering being done by a blond haired, green eyed 32-year-old gunman, looking much like a Nordic ideal (he claimed Viking ancestry), who apparently had no criminal record other than traffic violations. Jens Breivik, the father of Anders Behring Breivik, who said his son cut off contact with him in 1995 (Breivik was 15–16 years old), sent his condolences to "all those who have suffered" as a result of the attacks, and said he is in "a complete state of shock and has not recovered". Within a day, over 27,000 people signed up via Facebook for a memorial service in Oslo the next day, with numbers increasing rapidly. It was later reported that the whole country was watching the service. "Not a man in sight outside." Geir Lippestad, Breivik's lawyer, told Norwegian media, "I think he's realized what he's done, and he views himself as sane." Lippestad continued, "He has said that he believed the actions were atrocious, but that in his head they were necessary...He wanted to hurt the Labour party and halt its recruitment in the worst possible way, referring to party members as Marxists." Extra security was planned for mosques around the U.K.
"Your above-cited quote is a good case of historical amnesia, deliberate or otherwise... You apparently have never heard of (or don’t want to acknowledge) the Weathermen, the Black Panthers, the Symbionese Liberation Army, and others in the U.S.; not to mention the Bolsheviks in Russia, Mao Zhe Dong in China, the Khmer Rouge in Cambodia, Kim Jong Il in North Korea, the FARC in Colombia, the Sendero Luminoso in Peru, The MIR in Chile, and other Leftist movements throughout the world that have used terrorism as a tactic. I think an objective tally would prove that both the Left and the Right are equal opportunity terrorists." Fox News Host Bill O'Reilly stated that "No one believing in Jesus commits mass murder. The man might have called himself a Christian on the net, but he is certainly not of that faith." But atheist antagonist Bill Maher rejected that truth and asserted, "Religion ... gives people license to commit crazy acts," and warned of Christianity becoming "the violent blood-lusty religion it was under the crusades," ignoring that his own atheistic moral reasoning can justify the same or worse as false religion, while New Testament Christianity does not support such religious violence. Republican Margaret Hoover responded to Mayer on his show by referring 50 million who were killed in the 20th century in the name of atheism and communism (though 250 million may be more accurate), what she called "ideology run amok," and that Breivik only called himself a Christian, and in contrast to Islam, he was not "connected to a well -funded global terror network." The New York Times (which Breivik references a few times in his manifesto), in an opinion piece by Roger Cohen titled, Breivik and His Enablers, used the killing to implicate Sarah Palin with the attack on Representative Gabrielle Giffords, while naming Republicans such as former House Speaker Newt Gingrich and Representative Peter King as "ideological fellow travelers" with Breivik, as well as "U.S. church pastors using their bully pulpits week after week to say America is a Christian nation under imminent threat from Islam." The columnist called such bigotry, while he exhibited his own bigotry against the latter group of people, linking them to the actions of Breivik, and "a racist and murderous European right." At the least, liberal journalists charged that Breivik seems to have been motivated by the view of right versus wrong that animates the "Christian worldview," which pits Marxism, multiculturalism, Islam, etc. as enemies of God and truth, while the same journalists fight against evangelical Christian faith, traditional morals and those who uphold them as being enemies of liberalism's deleterious social experiment that has cost America and the world greatly in souls, lives and money. Others also cite evidence that liberalism is more prone to violence and terrorism. "As Christians and Conservatives, we want to express solidarity with the victims of the attacks of July 22. The hate that is driving Islamic assassins and fanatic individuals a la...Breivik is foreign to Christians and Conservatives." Christians killing others due to their contrary views. A possible exception might be in order to save others from being hurt in an immediate situation, but that is hardly a religious context. And historically, rather than religious violence, many Christian Evangelical “fundamentalist” groups have chosen to be complete pacifists, while acts such as the Crusades are seen to be the result of Biblical illiteracy and of men presuming a higher authority. This led to the conclusion that those who assert that Breivik was acting consistent with the Bible may be potentially as dangerous as he is. Many liberal secular sources were quick to label Breivik a Christian extremist, a "Christian fundamentalist with right-wing connections," or a "Christian terrorist," based upon a Facebook and a Twitter account in which he identifies himself as a Christian and a conservative. Breivik also claimed to be a fan of some violent video games, and whose favorite television show was the serial killer show "Dexter." He was also an advocate of performance-enhancing drugs for his mission, and was a somewhat advanced Mason. Although Breivik valued Christian morality in general, and had a perverse hope of glorification as a martyr, much of the value he placed upon religion was for the practical purposes of fulfilling his mission. While Breivik could express a lucid understanding of problems due to liberalism, he also evidenced various delusions. His method of achieving a "a secular European society based on our Christian cultural heritage", (p. 1346) was itself immoral, and not in accordance with Scripture, as was much of his idea of a such a society itself. Anders Breivik's motivation for targeting of the youth camp of the Norwegian Labour Party was apparently due to its support of the Islamization of Europe, which some assert implicitly supported terrorism. The day before the massacre, Norwegian Foreign Minister Gahre-Store visited the camp and was greeted with banners calling for a boycott of Israel, and Gahre-Store responded with an anti-Israel speech to cheers from the campers. It therefore seems evident that what Breivik was engaged in was a culture war for the institution of a quasi-Catholic based secular culture as opposed to Islam, but his murderous means of waging such was like those of the Muslim extremists that he abhorred, and which methods afforded him little moral high ground. Also, paradoxically, his manifesto, with its guide to waging war, may have provided Muslim terrorists and other violent radicals with improved tactics, while his actions are expected to make it more difficult to peacefully support conservative values. That Breivik understood the gravity of his planned program of actions is evident from his statements in his manifesto. In the event that he had "a successful mission" and lived to "stand a multiculturalist trial," he stated that not only would all his friends and family detest him and call him a monster, but that he would be "labeled as the biggest (Nazi-) monster ever witnessed since WW2." He wondered if he could biologically "survive the mental" pressures he expected, including physical torture, though he asserted, "I have an extremely strong psyche (stronger than anyone I have ever known)," and that "I will always know that I am perhaps the biggest champion of cultural conservatism, Europe has ever witnessed since 1950." ↑ 16.0 16.1 16.2 Anders Breivik Manifesto: Shooter/Bomber Downplayed Religion, Secular Influence Key. International Business Times. Retrieved on 31 May 2015. ↑ Gardham, Duncan. "Norway killings: Breivik's plan for the day", The Daily Telegraph, 26 July 2011. Retrieved on 29 July 2011. Archived from the original on 27 July 2011. ↑ Menzie, Nicola (26 July 2011). Norway massacre suspect manifesto rejects personal relationship with Jesus. Christianity Today. Retrieved on 28 July 2011. ↑ Sarah Posner, "How Breivik’s “Cultural Analysis” is Drawn from the “Christian Worldview”"
This page was last modified on 9 April 2019, at 00:09. This page has been accessed 21,324 times.